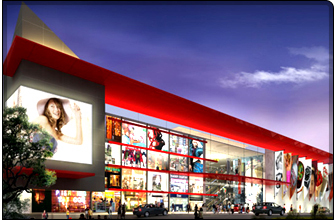 Ten Square Mall is not just about products available in one roof but all about the "Experience of Retail, Shopping, Gaming, Food and Fun." Ten Square Mall will be one of the most sought after destination with a total of 1,50,000sqft of space for Retail, Food court and Gaming arcades. Ideally located to the proximity of Bus Terminal and proposed Metro rail station, it promises to be a haven for one and all. Designed to be an Contemporary and architectural triumph Tens' Square Mall will house 4 floors plus terrace, 1,50,000sq.ft leasable area and a typical floor of 25,000sq.ft. The common areas such as lobby flooring will be designed with marble /granite and lift cladding. The mall will be fully air conditioned with 100% power back up. An exquisite sprinkler fire fighting system will be in place. The entire mall will be under video surveillance system, piped music/PA system. The Building will be with ACP, glazing and louvered panels for effective signages. Tens' Square Mall offers a wider selection of stores to the retail - multiple, small and larger formats A wider service area for large food courts, exclusive exhibition spaces, fully air conditioned atrium for product launch and promotional activity.